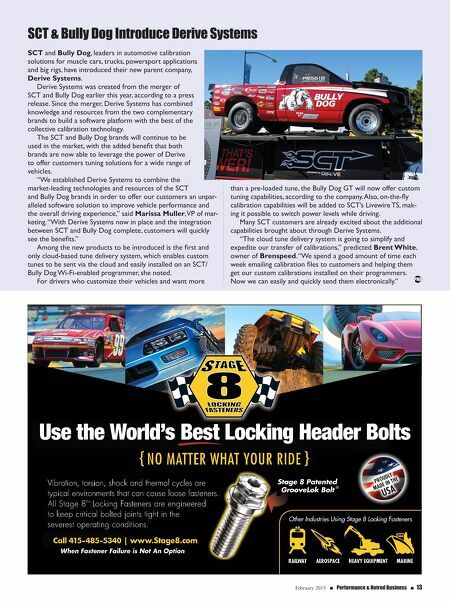 12 n Performance & Hotrod Business n February 2015 Nickels Strengthens KC Sales Warehouse distributor Nickels Performance has added Dan McLaughlin to the role of technical sales at its Kansas City location. McLaughlin will work with customers throughout the Midwest, according to the company, and has decades of experience in the performance aftermarket. "With Nickels' broad coverage and the large UPS one-day service area out of Kansas City, he is poised to make an impact in that area," the company stated in a press release. "We are lucky to have him join our team." McLaughlin's past experience includes stints with Weld Wheels, Taylor Wire and other WDs, the com- pany noted. Motovicity Distribution Changes Its Logo After 12 years with its original logo, automotive perfor- mance aftermarket distributor Motovicity Distribution decided it was time for a change. Its new, redesigned logo "needed to offer a timeless look that could both adapt and evolve with the company, while invariably appealing to the active lifestyle of its customers," the company noted. Famed freestyle BMX rider and designer Bob Haro of Harodesign was brought in to capture the look the Madison Heights, Michigan-based WD was after. Since 1993, Harodesign has helped such organizations as Red Bull and Nike's Olympic Cycling Team establish their images with youthful design elements inspired from its rich history in action sports, powersports and motor racing, according to the company. 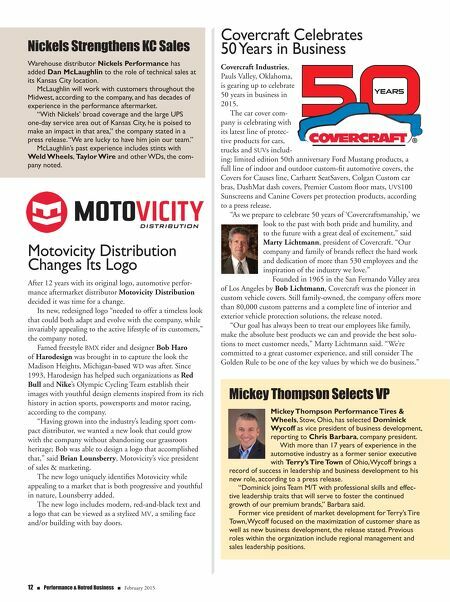 "Having grown into the industry's leading sport com- pact distributor, we wanted a new look that could grow with the company without abandoning our grassroots heritage; Bob was able to design a logo that accomplished that," said Brian Lounsberry, Motovicity's vice president of sales & marketing. The new logo uniquely identifies Motovicity while appealing to a market that is both progressive and youthful in nature, Lounsberry added. The new logo includes modern, red-and-black text and a logo that can be viewed as a stylized MV, a smiling face and/or building with bay doors. Mickey Thompson Selects VP Mickey Thompson Performance Tires & Wheels, Stow, Ohio, has selected Dominick Wycoff as vice president of business development, reporting to Chris Barbara, company president. With more than 17 years of experience in the automotive industry as a former senior executive with Terry's Tire Town of Ohio, Wycoff brings a record of success in leadership and business development to his new role, according to a press release. "Dominick joins Team M/T with professional skills and effec- tive leadership traits that will serve to foster the continued growth of our premium brands," Barbara said. Former vice president of market development for Terry's Tire Town, Wycoff focused on the maximization of customer share as well as new business development, the release stated. Previous roles within the organization include regional management and sales leadership positions. Covercraft Celebrates 50 Years in Business Covercraft Industries, Pauls Valley, Oklahoma, is gearing up to celebrate 50 years in business in 2015. The car cover com- pany is celebrating with its latest line of protec- tive products for cars, trucks and SUVs includ- ing: limited edition 50th anniversary Ford Mustang products, a full line of indoor and outdoor custom-fit automotive covers, the Covers for Causes line, Carhartt SeatSavers, Colgan Custom car bras, DashMat dash covers, Premier Custom floor mats, UVS100 Sunscreens and Canine Covers pet protection products, according to a press release. "As we prepare to celebrate 50 years of 'Covercraftsmanship,' we look to the past with both pride and humility, and to the future with a great deal of excitement," said Marty Lichtmann, president of Covercraft. "Our company and family of brands reflect the hard work and dedication of more than 530 employees and the inspiration of the industry we love." Founded in 1965 in the San Fernando Valley area of Los Angeles by Bob Lichtmann, Covercraft was the pioneer in custom vehicle covers. Still family-owned, the company offers more than 80,000 custom patterns and a complete line of interior and exterior vehicle protection solutions, the release noted. "Our goal has always been to treat our employees like family, make the absolute best products we can and provide the best solu- tions to meet customer needs," Marty Lichtmann said. "We're committed to a great customer experience, and still consider The Golden Rule to be one of the key values by which we do business."